Enamoured by small things ever since I was a little girl (Do you remember Charmkins and the books series The Littles ? 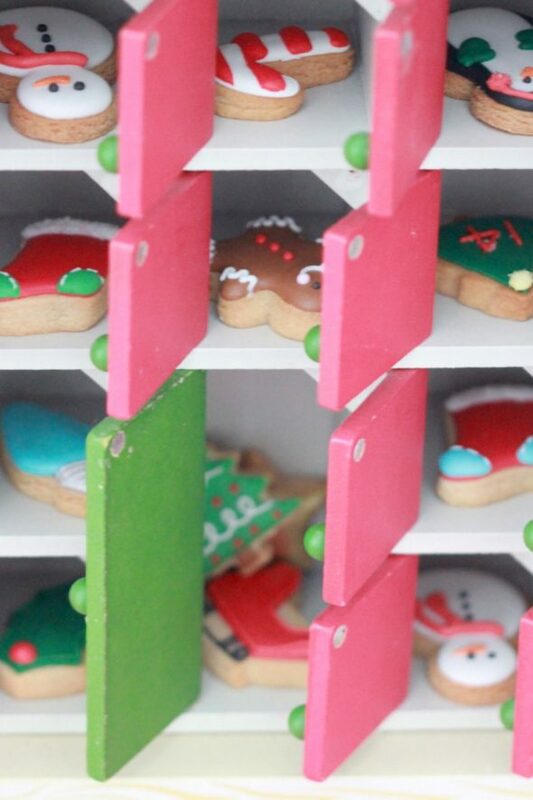 ), I was excited to make these super sweet mini cookies to fit into my wooden Advent calendar this year. Even with Advent a week a way, these cookies are definitely doable – they’re easy to decorate and dry so quickly. Because these cookies are so small (see quarter for reference below), I kept the decorating details simple. If you’d like to make them too, my recipes and how-to links follow. The penguins and snowmen cookies are from my last Peanut Butter Cut-Out Cookie Recipe post, so I matched these Christmas minis and used the same recipe. 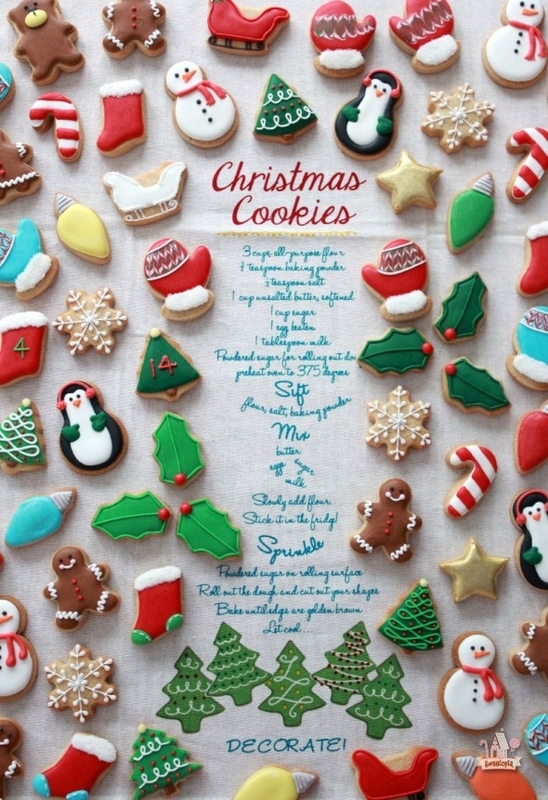 My favorite cut-out cookie recipes can be found here. 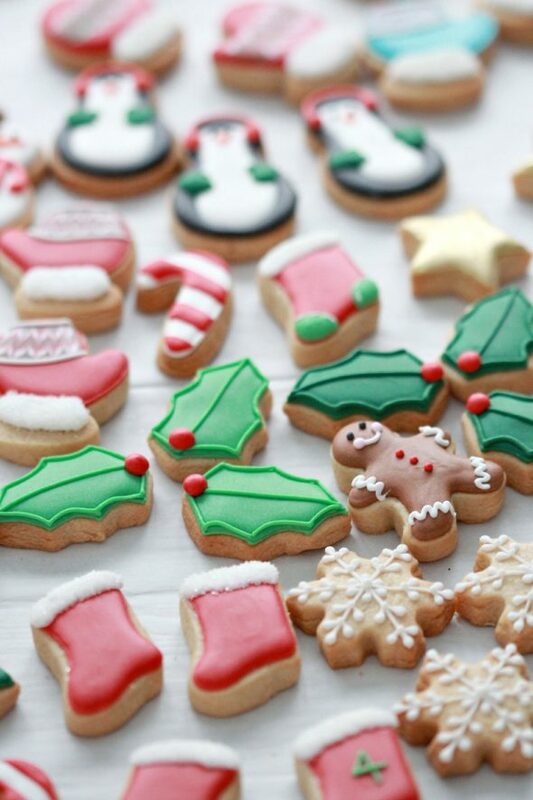 Regardless of the one you chose, be sure to follow the tips on preventing cookies from spreading. A dedicated post on that can be found here. The icing recipe I used can be found here. Consistency of the icing for this kind of decorating is key. To help you find the decorating consistency you need, here is a video. If you’re new to cookie decorating, this tutorial will give you all the basics, and if you prefer video check out my YouTube page for tips on tools, basics on flooding cookies etc. I used #1.5 piping tip for all the piping on these cookies. 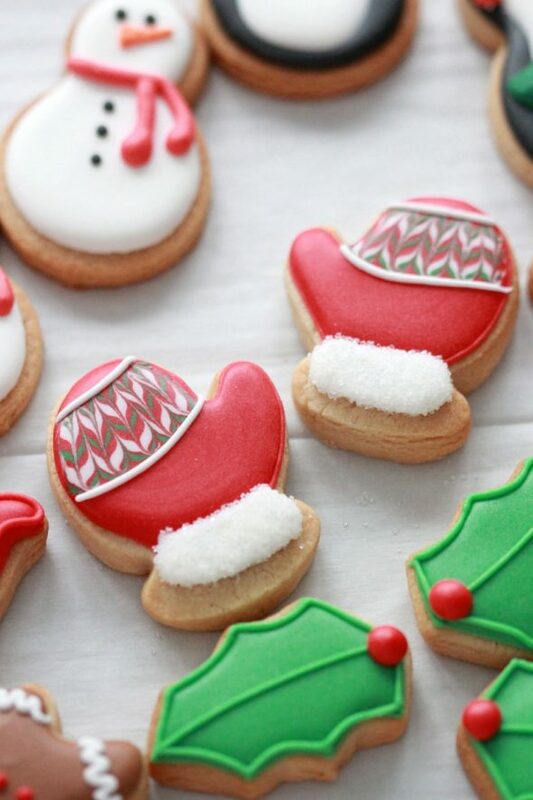 Because humidity can cause icing to bleed, check out this post on drying decorated cookies. Even if you live in a colder climate, like I do, humidity can still be high. I like to check the weather network to see the percentages on the days I’m decorating. Following the tips in the latter suggested post will help you regardless though. I found the wooden Advent calendar at Sears in 2013. I’m not sure if they would still sell it, but I saw another adorable one at Target the other day and Amazon sells some charming versions too. The mitten, penguin and stocking cookies have sanding sugar sprinkled on, and the star cookies are painted with gold luster dust. I have not tried making the recipe on the tea towel pictured in this post. You can find the mini mini cookie cutters here. 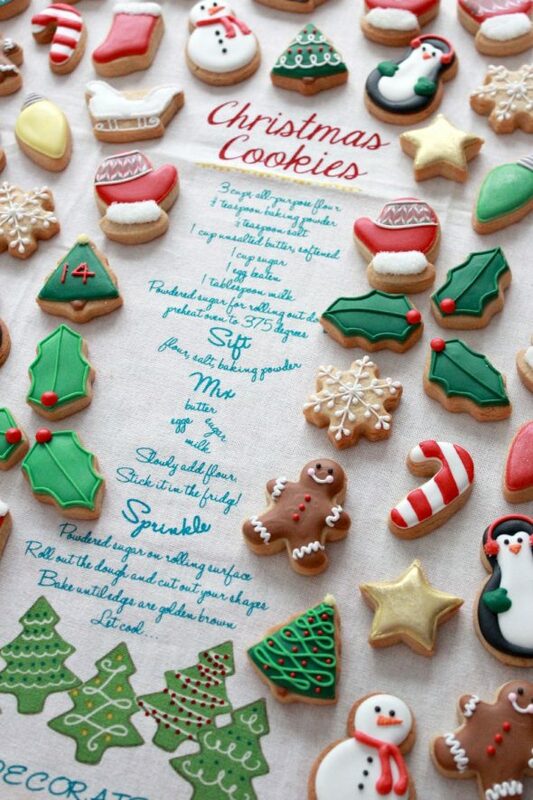 Have fun decorating your cookies! Thank you so much for this beautiful idea. My two children are special needs and I didn’t want an advent with things to do (because they usually can’t!) and this is the perfect alternative. Besides, who doesn’t love adorable little bikkies?! Are you from Australia? I love how you called them bikkies, so cute. And I’m glad you’ve got an activity you can enjoy with your kids. I have to say, I’m a teacher and many of my special needs kids seem to really love cookie decorating. Have fun! What a fab idea! Beautiful work again. Thanks so much Cake Angel! This is just precious! I love the whole idea, and the tea towel is adorable! Gorgeous work, amazing talent, what a beautiful idea! I love the advent calender house. 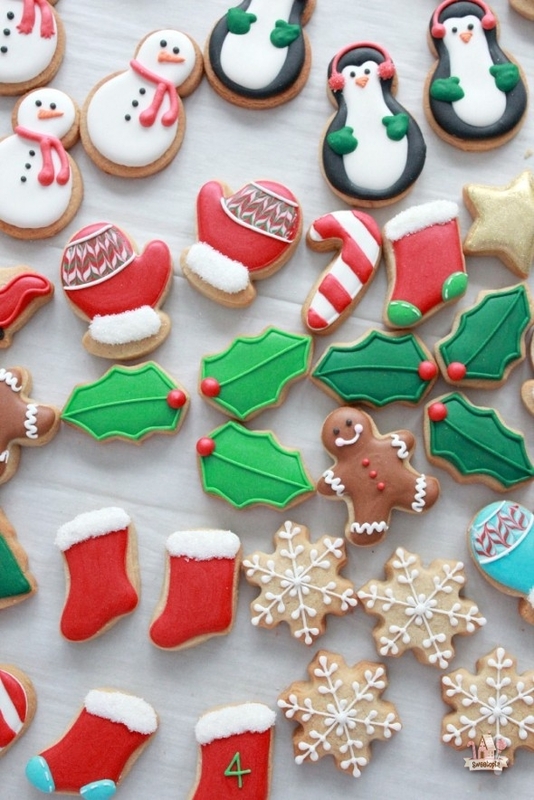 All the cookies in this collection are breathtaking. The mittens are very special. Thank you for all your hard work. Enjoy opening the advent “laedeli” daily. always so beautifully done! Please let me know where this tea towel is from, I love it! I bought it a local store; Winners. I searched for it on line and couldn’t find the company, I’m sorry. Absolutely beautiful works of delicious art Marian!! Especially love those adorable penguins, and the wooden calendar is marvellous!! You are so incredibly talented!! It is 6 a.m. and I am inspired to get baking!!! Hee hee, perfect time to start baking actually. 🙂 Thanks, Shannon! Happy Monday Marian and thank you for such a beautiful post, I needed it today!! 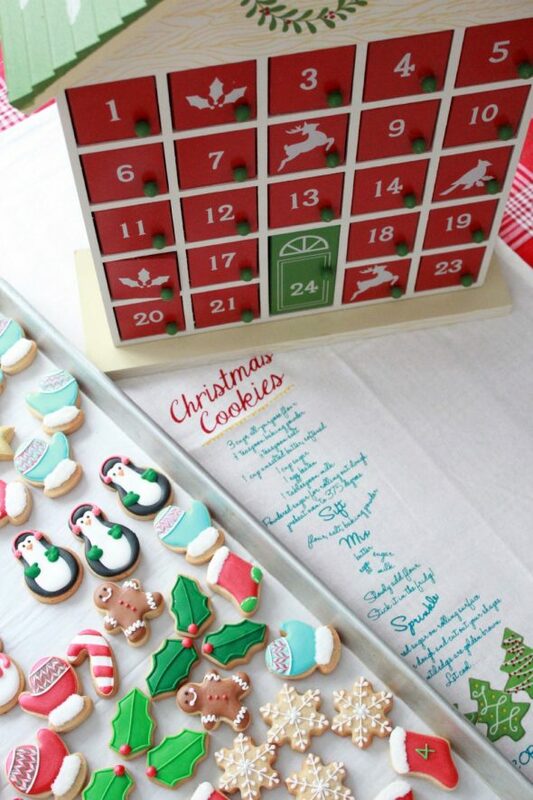 I wish I had this calender at home, with YOUR cookies, how exciting that would be. Thank you sooo much for posting this Marian! My daughter moved over 2000km away this Summer to finish college and I wanted to send something that spoke of home and wanted to keep her in our family traditions, this is just the ticket. Marian you are a freaking genius! I have a beautiful wooden advent calendar too but I hate filling it with crappy dollar store treats or candy cause they are the only thing that will fit! What a perfect idea!!! I’m so doing this next year!! 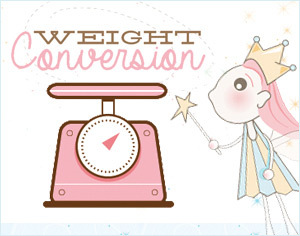 (Cause lets face it…December is just days away! Colour me inspired! Thanks! Marian I just keep looking at these adorable cookies over and over. How do you do it? 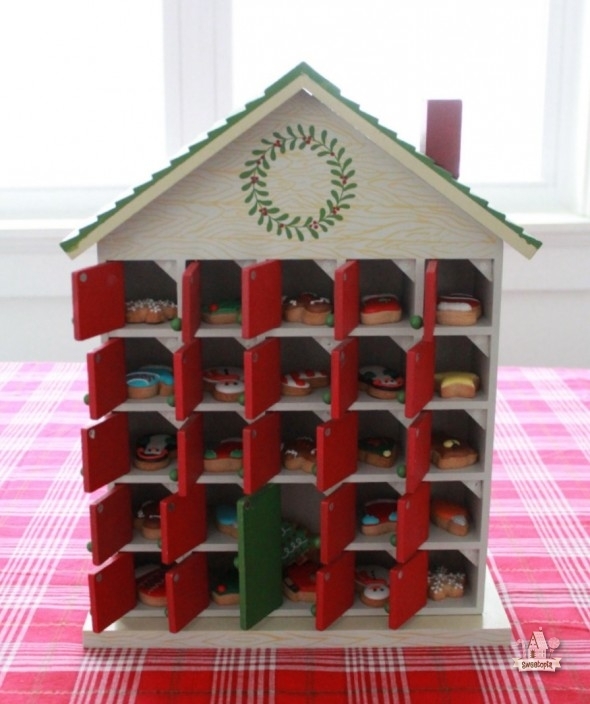 I love advent calendars and leave it to you to do something so charming and artistic. I’m going to try that peanut butter recipe. Used your other recipes for sugar, gingerbread etc. and they are excellent! All my cookie creations are Sweetopia inspired. Happy Holidays to you and your family! I’m so flattered – thank you for your comments! Thank you for always coming to visit me here – I remember meeting you and your husband at the Baking Show, already a few years ago now – would love to see you some time again! Happy Holidays to you and your family as well! 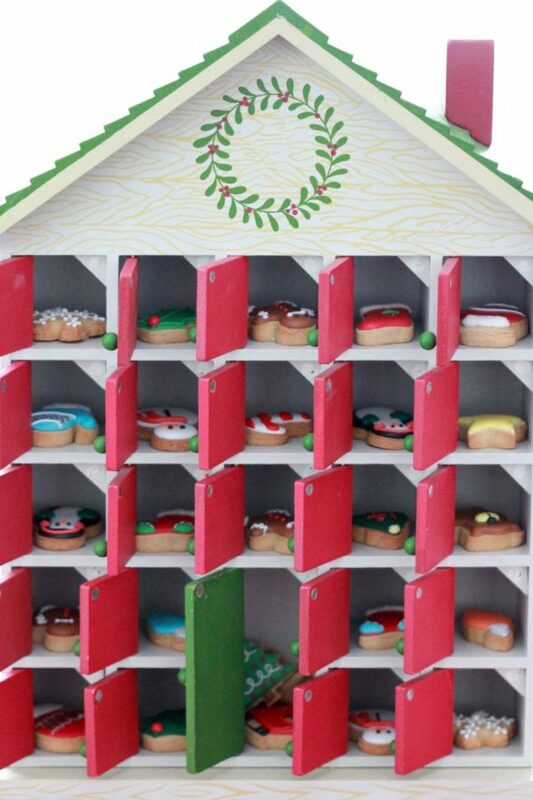 Marion, I like your Advent Calendar house but I am especially interested in those miniature cookies. I went to the Amazon website by clicking on the link from your site. I was directed to the Wilton 12 pc mini cutter set. It doesn’t have the glove or snowman shown in your picture. 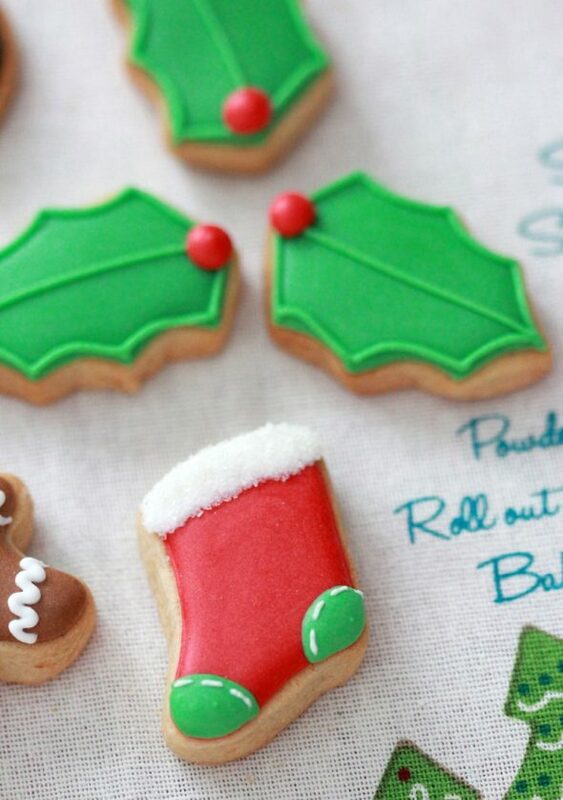 Where did you get the cutters for the cookies shown? Thank you. 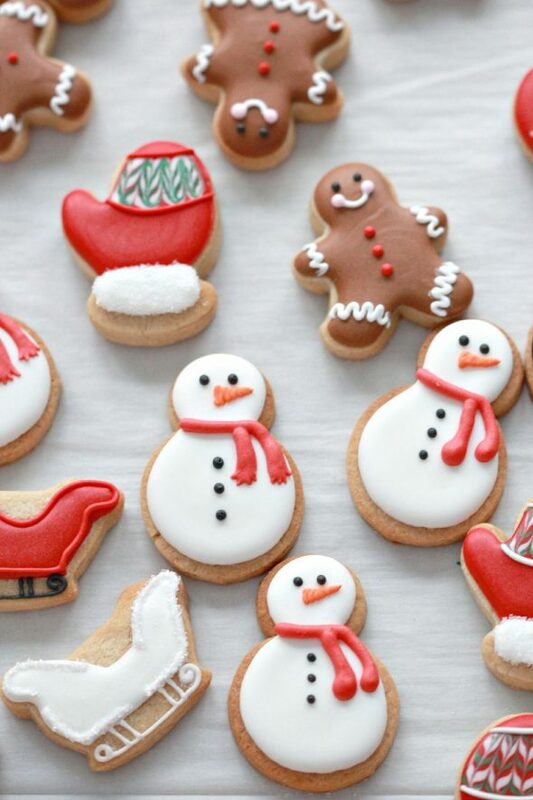 Where did you get the snowman/penguin cutter? I don’t think it’s included in the Wilton set. Hi Marian, as always your tutorials are so beautiful and detailed. Thank you so much for taking the time and share your tips. 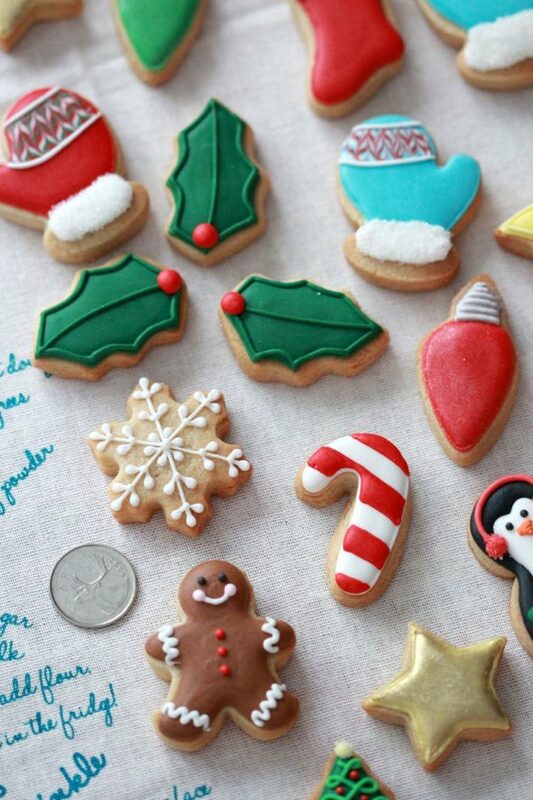 Love this idea of miniature cookies, they are so cute! 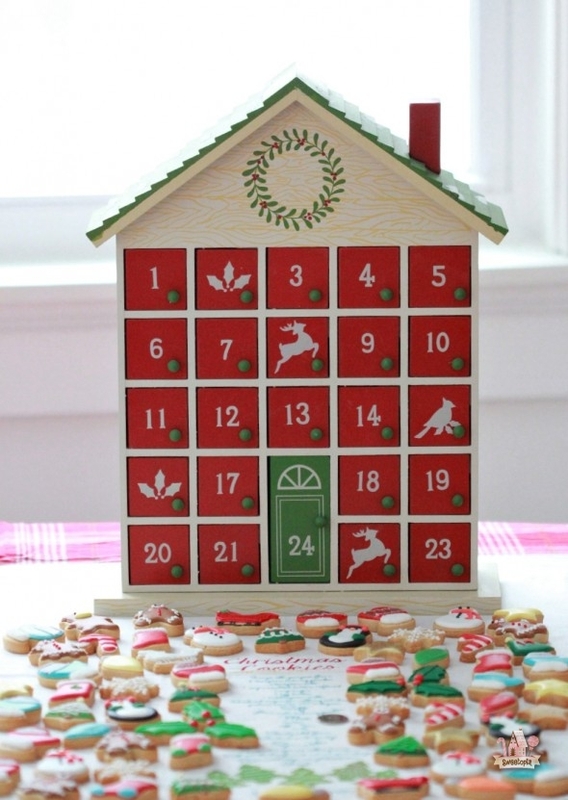 I searched high and low for this cute advent calendar and sadly it’s no longer for sale 🙁 I would love to buy it off of you if you’re willing. My kids would love it! Where do you purchase your mini cookie cutters? I want to buy a Christmas set, but can’t find one that actually has all the items I want. I collect cookie cutters so have bought them all over the place, for about 10 years. My favorite spot is on line for mini ones though, as they can be harder to find. Here’s a link with quite the selection; http://amzn.to/2hRiTCq Happy baking!